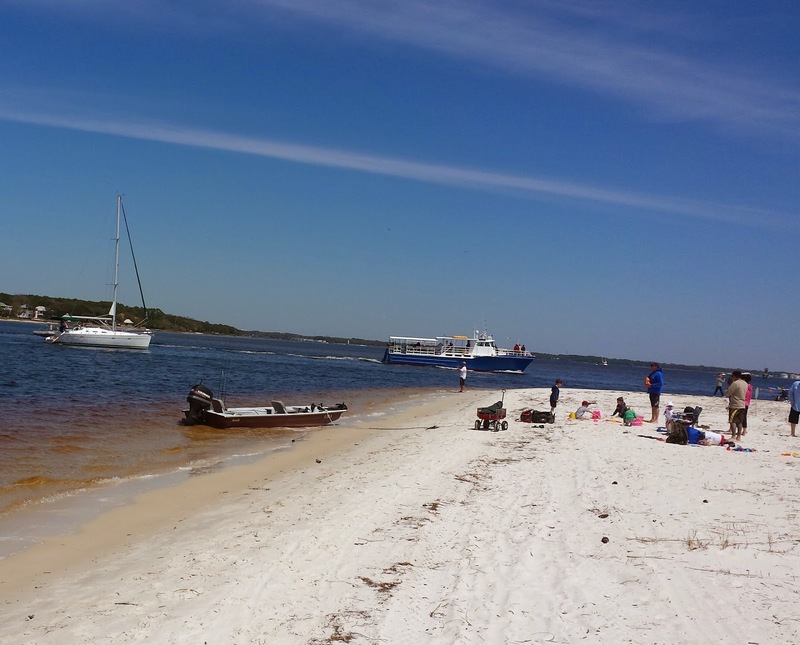 Spanish explorers gave the St. Andrew Bay near Panama City Florida its present name in the 1500's as they explored the northeast gulf coast. I am planning to operate QRP TO The Field on Tres de Mayo or May 3rd. I will be headed to Sandy Point at St Andrews State Park on the bay. I like Sandy Point because good deal of the azimuth is salt water. The Spanish tie in will put me in the QTTF Fiesta Category. See See this link for all the rules. 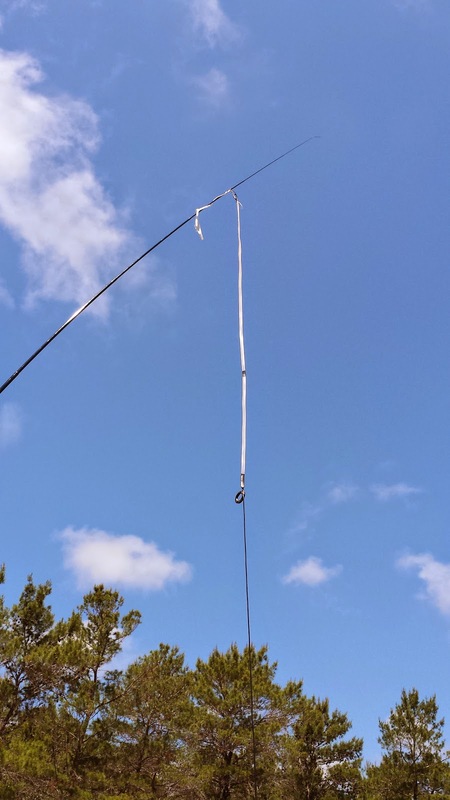 The RaDAR Community will be having their Monthly On The Air Meetup to coincide with QRP To The Field. The weather looks promising for Saturday. I hope to be on the air 1400 - 2000 zulu. I anticipate being around 14.060 and checking 21.060 and 28.060 for CW and 14.285 and checking 21.385 and 28.385 on SSB. I will do a CQ RaDAR on the hour and CQ RaDAR SSB on the half hour.to flush out RaDAR Operators. The band will vary. 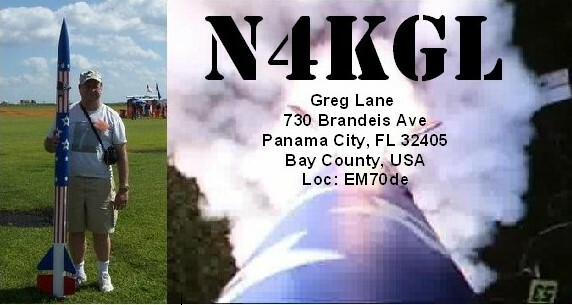 I am looking forward to many QSOs and will enjoy the outdoors. Join in if you can! I have an Icom IC 7100 as my base rig. 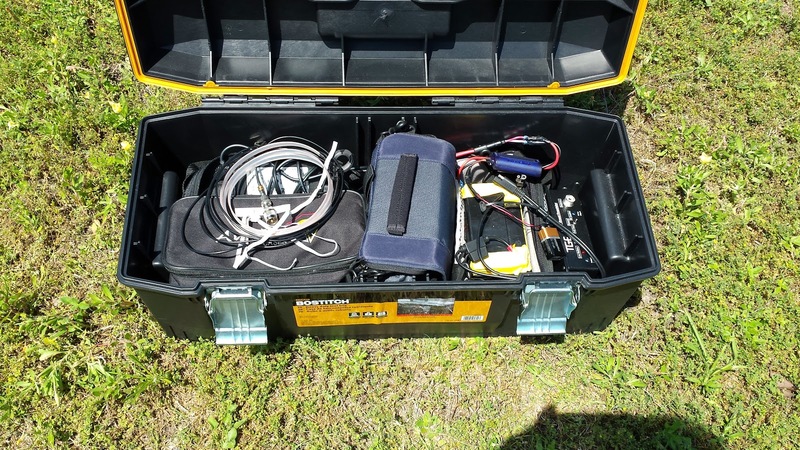 However being such a fan of Rapid Deployment Amateur Radio (RaDAR) I can't resist setting it up in a Go Box configuration. 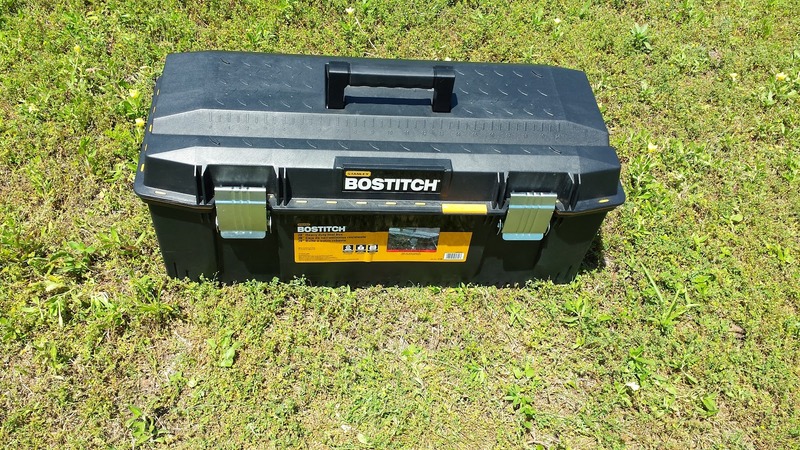 Basically I am just packing the gear into a toolbox. I can have the main unit and the battery in the box and the control head on my table. 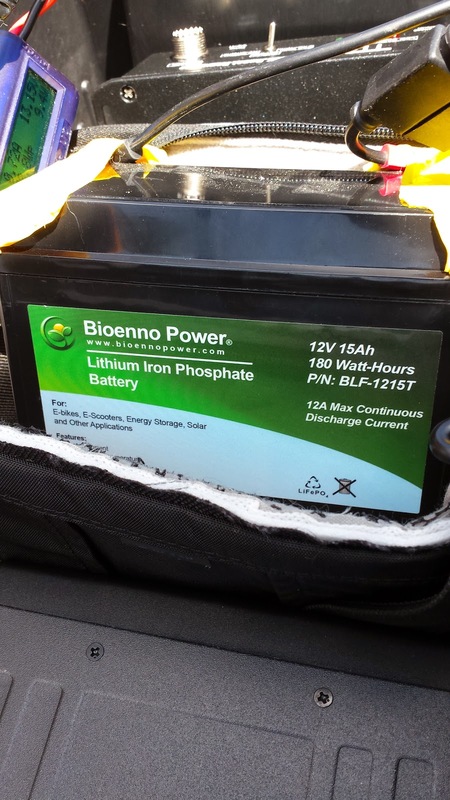 My battery is a Bioenno LiFePO4 15 amp hour battery. 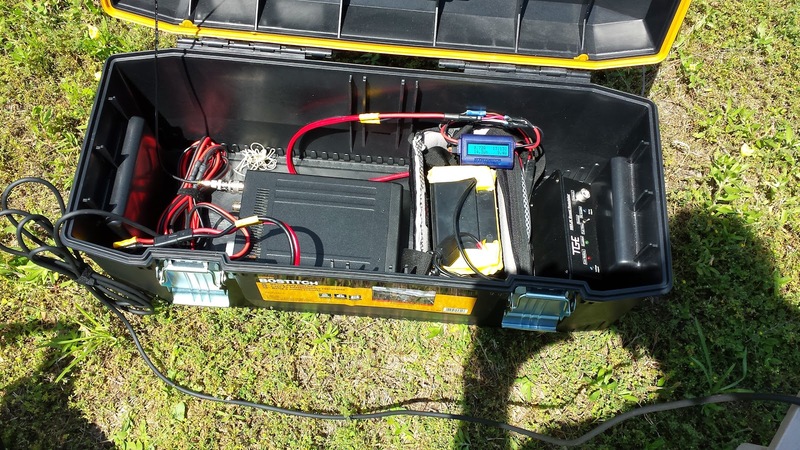 This battery sustained the KX3 at 10 watts for the entire Field Day last year. 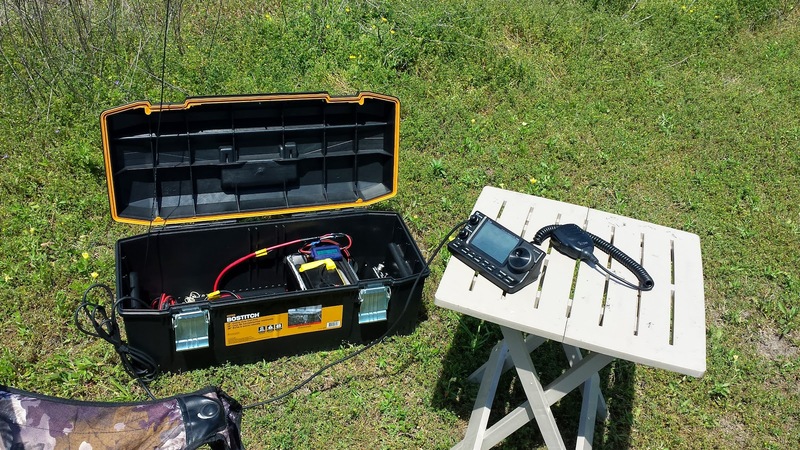 The Icom 7100 presents some additional challenges for battery operation. It does not seem as battery friendly. The first issue is the Icom 7100 is specified at 13.8 volts plus or minus 15%. This means the lowest voltage is 11.7 volts. I find that when it drops below 11.7 the rig will abruptly shut down. I guess they did not promise anymore than that. It is pretty easy for this to happen due to the voltage drop due to the internal resistance of the battery. I estimate the internal resistance of this particular battery is about .12 ohms. A 10 amp draw could drop the voltage 1.2 volts. This combined with losses in wiring gets you in trouble pretty quick. The bottom line is you will get the rig shutting down even through you have lots of energy left in the battery. There is something you can do to mitigate this issue. Enter the N8XJK Boost Regulator. I have one in the Go Box. It does what it promises. It will take what ever the battery voltage is and boost it to 14.14 volts open circuit (Adjustable up to 15). Under load it seems to keep the voltage above the 13.8 point. I think it is fair to say this 15 ah battery may be a little small for this job. It is not sized for the 22 amp draw for a hundred watts. But I am thinking maybe 40 watts SSB and 20 watts CW just to not push it too hard. Then there is something that was surprising. If you turn the power down to QRP the 7100 is still draw six amps or so. So you won't economize by shifting to QRP. All this makes me appreciate the job Elecraft has done on the KX3. It will reduce the power instead of shutting off. It is also very power efficient. Oh well this makes me think the Elecraft 100 watt amplifier would be something to look at. Then running more than 10 watts portable is questionable anyway for casual operations. However, Field day is coming and I plan to exercise the 7100 at 40 watts and see how it does. I have some photos from when I took the 7100 Go Box out on my lunch break. I talked to locals Vic K4GXV and Bob WB4BLX via DStar on 2 meters. I did not get around to doing HF. The antenna is a lightweight roll-up slim-jim. The voltage booster is on the right end of the box.